I've been noticing a lot of cross jewelry circulating the internet, and I'm obviously a big fan (a bit late hopping on the bandwagon, but whatever)! I was never really into jewelry until recently, but that was because I never thought that jewelry really suited me (tomboy problems). That being said, I tend to gravitate towards very simple jewelry. I must have been living under a rock until recently because I had never heard of ASOS until a few months ago. What I like about ASOS, apart from their free international shipping, is that their jewelry selection is very trendy and affordable. 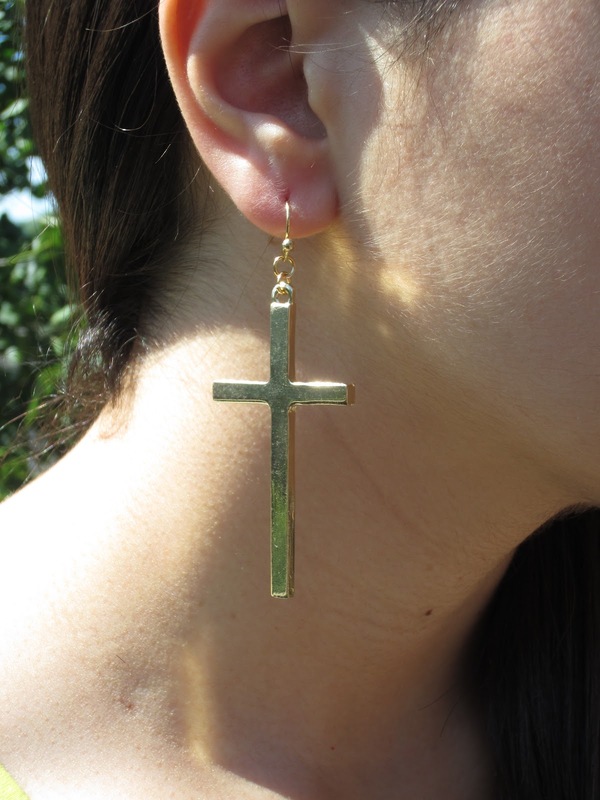 I picked up these large cross earrings for 11 dollars, and while I do really enjoy them, the backs of them are hollowed out. That was disappointing, but I guess you get what you pay for. Their size can be pretty intimidating, but while they're a bit large I feel that you can easily pull them off if you have a very simple outfit; letting the jewelry be the statement piece(s). I was recently at The Bay and the 'Material Girl' line had some items on sale. As you could see from the first picture, this came in a pack of three with a pair of diamond studs, as well as a pair of peace-sign studs-- but in truth I only plan on wearing the cross hoop-earrings. They're very simple and they're not too big, making them very cute and a lot easier to wear compared to the ASOS cross earrings. I first saw this sideways-cross necklace being sported by Laura of buynowbloglater. I thought it was so feminine and unique..needles to say I finally caved and got my own. The chain is thin and dainty so it gives it a nice feminine touch, and it would look really nice if you layered it with more gold-toned necklaces. hope you're all taking advantage of the late summer-sales!